Whenever your band has a big name and reputation in the metal/extreme metal scene, there are expectations with each new album. For me, Rituals meets those expectations and goes above and beyond. These Greek metal stalwarts became well-known in the underground for their earlier works of black metal, then transitioned to a gothic metal style, and now into what I like to call grandiose dark metal. Rituals is quite grandiose, and while Rotting Christ play on the styles that the band explored on their previous albums, Katá ton Daímona Eaftoú and Aealo, they vary heavily on the album and execute them more atmospherically—yet, it’s still crushing. 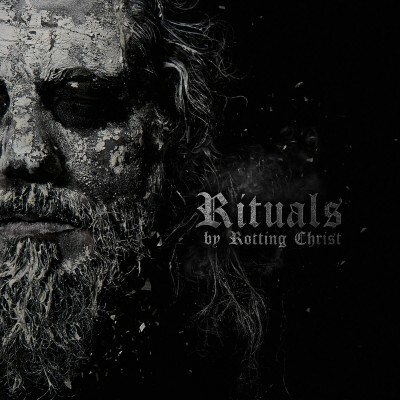 Rituals may just sound fresh and new to my ears, but for me, it plays out as more interesting and more engrossing than Rotting Christ’s other recent output. Despite the vinyl version of the new album being released on a double-LP, the album maintains a duality of the “Side A / Side B” dynamic. The first half of the record exhibits plenty of atmospherics. The band performs vocals in Latin and Greek with an almost evil–Gregorian chant method, and the songs flow together nicely, which keeps the pacing fast. The drumming on the first half of the album is one of its key elements and driving factors. It’s the drums that crush more intensely than any riff—the song “Apage Satana” is almost all drum and vocals—even the riffs cling to my ears like black tar. The songs, in a way, feel simplified, but conversely, more dynamic than the last few albums. From rough translations of song names, Rotting Christ have returned to more Satanic themes than Katá ton Daímona Eaftoú’s more lyrical types of cultural and mythological themes. Despite what Rotting Christ actually say lyrically—because I don’t speak Latin or Greek—this lyrical direction helps amplify the themes of the album and its mystical, magical feeling. Back to the structure of the album, the second half becomes a bit more structured with less atmospheric styling. The rhythm gets slower, but the record transitions from a powerful, bone-crushing feeling to an intensely darker and grittier vibe. One of the English-titled tracks, “For A Voice Like Thunder,” starts out with a sample of battle sounds and turns into a spoken-word passage that becomes almost gratuitously dark—it’s also the first track to feature the slower rhythm style and focus more on the guitar structure. The fast, epic, fist-pumping-type songs fit Rotting Christ’s live shows in the way of getting the crowd to go, “Hey, hey, hey!” Fortunately, however, they often divert from that high energy to slower moments. The style of this record fits the live feeling of Rotting Christ perfectly. I can see that the band focuses on crowd interaction as they take album opener “In Nomine Dei Nostri,” which features a drum/riff combo with high energy, and move down tempo to a slower, doom-like song like “Devadevam.” The duality of Rituals is its greatest strength as it mixes up energy and momentum, which results in a fully engrossing record—one that is more than I hoped for from Rotting Christ.